Painting tips from me will be about as basic as it gets, I'm no expert. Surface prep is where the average paint job fails to look as good or last as long as it should. Painting over dirt and loose paint may look better than it did, but every bit of time spent (scraping, sanding, cleaning) is time well spent. There may still be times when there is that little bit left in the gun. In that case, doing a quick dust-off and respray of some running boards, or pedals on another tractor is better than dumping the extra paint on the ground. The photo above shows two extremes. Lots of time and effort was spent on the sheetmetal, but the transmission and rear castings were just a quick spray-over. If you want a show-quality finish, there is no substitute for stripping everything to metal. If all you want is a better looking tractor, stripping all the way to bare metal is often not necessary. Seal all openings. Remove or cover the carb and ignition components. Then give the tractor a really good power-washing. You will need some scrapers and wire brushes to help remove caked-on gunk. Power Washing is not the preferred method of cleaning your tractor on a regular basis. Frequent power washing will thoroughly screw up carburetors, distributors, air cleaners, gauges, and electrical components. Remove all dirt and loose paint. Sand smooth and feather-edge old paint drips, sags, and chipped areas. If you cannot feather-edge chipped areas without flaking off more paint, the old paint is loose and needs to come off. Keep scraping and sanding until the finish is smooth to touch. Now is the time to do any body-work or cast iron repairs. It is possible to braise or weld cast iron. You can even use liquid metal epoxy for some repairs or cosmetic work. Some people can feel if a panel is smooth, others spray a quick coat of primer to see if more work is necessary. 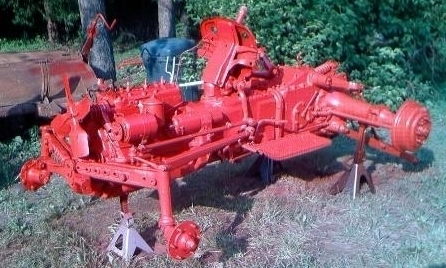 it is generally easier to paint small parts and sheetmetal separately from the tractor. Removing sheet metal, tires, and anything else that should not be painted may be easier than trying to mask those items. Disassembly allows different colors to be painted without masking. For these reasons, painting is usually just one part of a much longer list of repairs. If major engine work is needed, all the parts removed can be cleaned and refinished while the engine is in pieces. Nothing spells "amateur" better than overspray on tires, or painted wiring and rubber parts. Things that should remain unpainted should be carefully masked or removed. There are several spray-on products that make tires look like new. In fact, a little dish detergent and water scrubbed on tires does as well as many of the sprays, costs less, but is more work. I accidentally discovered that the lanolin hand cleaner works better than anything else to restore smaller rubber things like plug wires and shift boots. The Ford 3000 pictured above came with hard plastic shift knobs and steering wheel cap. Rather than try to make those look good, I turned new ones from billet aluminum on my lathe, then polished them till they look like chrome. If you are into woodworking knobs could be a fun rainy weekend project. Air Compressor, Rattle Cans, or Brush? Many very nice paint jobs have been done with rattle cans or even a brush. Using a spray gun does not guarantee a better job. If you already have an air compressor, almost any spray gun is a good investment. One quart can of paint, applied with a spray gun, will cover as much as about 12 rattle cans. Painting with a brush takes much longer and generally uses a lot more paint than spraying. For small parts and small jobs, it's hard to beat the convenience of rattle cans. Sadly, my long time exclusive preference for Rustoleum "Stops Rust" spray paint has ended. Rustoleum was always my first choice for metal, and always gave good results. Unfortunately, when they redesigned the nozzles away from the universal tiny male spray heads, the Rustoleum spray cans no longer work for me. Paint or primer, the new cans just spatter, sputter, drip, and clog. The nozzle can be cleaned, but then every single Rustoleum spray can clogs internally with 25 to 50 percent of the paint still in the can. After collecting a dozen or so partially full cans that will no-longer squirt, I got tired of wasting money and started buying Krylon spray cans. I over the last two years I've not had a single Krylon spray can fail to work as it should. No matter how you plan to apply the finish coats, always use a good primer that is compatible the paint you are going to use. Without a good, compatible primer, finish coats of paint do not stick well to the bare metal. Spend some time making sure the surfaces are clean, smooth, primed, and ready for paint. This is the step that has the most effect on the quality of the finish. Start with one light coat of primer. Then carefully inspect the appearance. How good did you do on the bodywork? Small imperfections can be filled with primer by spot-painting them and lightly-sanding until the primer fills the low spot. Tractor sheet metal is plenty thick enough for traditional hammer and dolly work. Some folks will use a skim coat of bondo and then sand the panel, leaving bondo only in the low spots. I believe that is going way too far for a working tractor. I'm happy if the panels are mostly straight. A few small dents add character, grin. Once you are satisfied with the bodywork, shoot one light coat of primer on everything. Let it dry thoroughly, then sand with fine (180-220) grit paper, or use clean steel wool. Finally, just before spraying the first finish color, go over the surface with a clean rag and mineral spirits to remove any dust or oils. A single oily finger print can mess-up the finish. If you are painting in the great outdoors, try to pick a day with low winds, not too much sun, and few bugs. Good luck with that. When I'm ready to paint I paint. My 8N is nicknamed "BUGS" for all the gnats that were covered in the paint. If using an air compressor and spray gun, one quart of primer and one quart of each color is enough to do the 8N red-belly paint scheme with two coats of the finish colors. If you want more coats or shoot much thicker coats, get two quarts of each color. For most working tractor paint jos, my advice is to skip hardeners and other paint additives. Paint fumes are bad enough without adding more toxic substances. Few home shops have the proper booth, clothing, respirators, and other equipment required to shoot paint with additives. That stuff can kill you D-E-D dead, or make you wish you were dead. Get the material safety data sheets for any paint additives you think you want to use. Just do a web search for the product and add MSDS to the search. If you become sensitized to some of these products, it may put you in the hospital and cause permanent health issues. It just isn't worth the risk for a one-shot deal on a working tractor. Leave additives to the folks painting show cars who have the proper safety equipment. Finally, the benefits provided by additives are completely wasted on a working tractor. A good quality enamel will last at least 10 years and still clean up well (if you ever bother to wash the dirt off your working tractor). It's been well over ten years since I painted my 8N and 2N. None of the warts they have collected over the years would have been prevented by adding hardener to the paint. With most paint guns the paint must be thinned for spraying. My spray gun seems to like thinning with 5% mineral spirits (that works out to adding 1.6 ounces of mineral spirits to one quart can of paint). There is enough room in the quart paint can to add the thinner, put the lid back on, and shake it up. Information about thinning and spray tip size should be printed on the paint can. The newer HVLP spray guns create a lot less overspray than the older type of equipment that I use. If you adjust the HVLP gun correctly, you should be able to get good coverage with a lot less overspray. You still need a mask to keep overspray out of your lungs. For a one-time deal, painting ooutside, with good ventilation, the disposable masks work fine. A cheap clear paint will turn yellow, crack, flake, and generally look ugly much faster than plain enamel and decent quality vinyl decals will last without clear coat. Good quality vinyl or water-transfer type decals last about the same time as paint for me (5-10 years). There are different grades of vinyl and some inks are more UV resistant than others. Cheap vinyl decals will soon start to curl at the edges, and quickly fade. After experimenting with several clear coat products, most have created more problems than they fixed. In theory, a good clear coat should provide additional UV protection, provide a deeper shine, and stay shiny much longer. This works really well for modern automotive base coat, clear coat finishes. It is very difficult to do a good base coat, clear coat finish in the typical garage/barnyard. The better clear coat products cost at least $20 to $25 for one rattle can, and about $30 for a quart. Adding clear coat more than doubles the cost of just spraying enamel. Some of my projects have turned out great, and were worth the effort/expense. Some have been a complete failure. Some purists may whine about green and yellow Fords or 9N tractors painted with the Red-Belly paint scheme. Tough, this is your tractor, so feel free to paint it any colors you choose. I believe the best value is to stay with original colors. Any future restorer is going to strip whatever paint is there and start over. No-matter what color you use any paint will protect the metal. One story going around is that Barn Sparrows had been making such a mess of the Dark Gray 9N paint that Ford wanted a new color for the 8N that would not contrast as much. Yuck, thankfully I have not found any official reference to "Sparrow Poop Gray Paint" ever being an official Ford color. Some say the red was to make rust less noticeable. That rumour seems like something that might have been created by the John Deere club. Trying to match original colors is difficult. Modern paints are very different, and perform much better than the original paint. Nothing you buy today will appear EXACTLY the same as the original finish under all types of lighting, and it certainly won't age the same. What looks right in your garage might not look right in the sun. Camera and monitor settings vary so much I often get different looking colors in photos of the same tractor, taken under the same lights, a few minutes apart. Not surprisingly, there is a lot of disagreement between the various experts about the best match for original colors. Some have their paint custom-mixed to match the color on a part that has been protected from sun and weather. I put very little faith in the theory that paint on the back side of a part has not changed color in 50 years or more. Even hidden from sunlight, old paint has been exposed to temperature changes, humidity, fuel vapors, oil, ... We could go to the local New Holland dealer to buy "original color" paint. By all accounts the Ford Red sold by New Holland dealers is too orange for the 8N tractors. 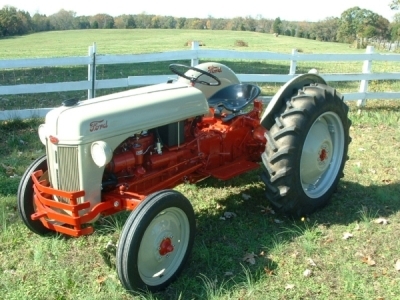 It may be correct for the '01 series tractors that started around 1957. 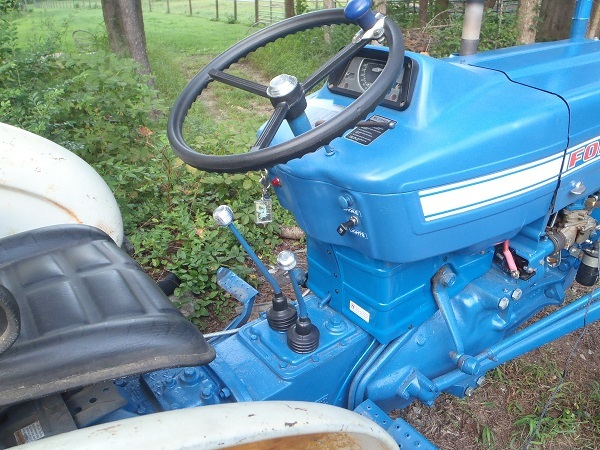 The New Holland "Ford Blue" is certainly not the same color used on the older Ford tractors. I prefer to use readily available standard paint colors that come reasonablt close. There are more than enough colors available. In some cases there are "Farm and Implement" colors that may be closer than anything else off the shelf. The first row of color swatches above is the RGB color codes taken from various published Ford color code charts. The second row of colors is the RGB codes for the colors I use. This is only intended to show how close I can get to the "real" colors using off the shelf paint. The colors I choose are generally slightly lighter in color because the original paint very quickly faded to a lighter color. I feel choosing the lighter shade is closer to what a fairly new working tractor would look like in the wild. Different computer screens show the same colors differently. Even the same screen with slightly different adjustments will not show the same colors. So comparing "live" colors to anything on a computer screen is mostly a waste of time. My color swatches in the chart above were created by going to various manufacturers web sites and getting the internet color codes they use for their swatches. I believe the manufacturers spend a lot of time choosing internet color codes that should look closest to the real colors. I believe this is the best way to compare paint colors on-line, even when the colors may not display correctly. If the color I want is a little less bright, or a little less blue than a known color, I can compare manufacturers RGB color codes to find something that should look better. This method has been worked well for me, but I still test colors by getting one rattle can, or a pint to see the real color on real parts. I decided to stick with what I know and use Rust-Oleum "Stops Rust" paint. I have had good performance in the past with this brand and their useless rattle cans do not affect how the quarts spray and perform. Rust-Oleum used to have a color 7755 Light Olive, that I believe was very close to the correct Ford Light Gray, but it was not available anywhere in this area. They used to list the color on their web site, but it is no longer even listed. For the 52, I decided to get a quart of Rust-Oleum 7786 Smoke Gray, and mix it 50:50 with a quart of 7792 Gloss White. The color I ended up with was a little too light, but since the correct color tends to fade to white, it was not a bad choice. The idea was to find an easy mix that would be easy to repeat for touch-up or replaced parts. After all that, the 46-2N should have been easy, simple, dark gray, right? Nope, that would be too easy. I decided to go with the 8N paint scheme. This time, for the light gray, I used a quart of Rust-Oleum 7786 Smoke Gray, mixed 50:50 with a quart of 7770 Almond. The color I ended up with lookes better, and is still very easy to find and make again. The following table has all the information I could find regarding original colors of various parts. This table is good for the vast majority of these tractors. HOWEVER, The earliest 9N tractors were very different from most other 9N tractors. There was more chrome on the very early tractors (radiator cap, gauge bezels, choke knob). The early 9Ns also used a four spoke Ford truck steering wheel with a chrome hub cap. Later tractors used a 3 spoke steering wheel with an exposed chrome washer and nut. After painting, the hardware used to attach sheet metal and other parts during final assembly was generally just standard Cad-Plated hardware. The Manifold is shown as UNKNOWN in the table because they may have been plain castings or painted. I have not been able to nail this down. It is almost meaningless anyway. Even if they were painted, the paint soon burns off the exhaust portion of the manifold. If you don't like rusty cast iron, the best product I have found is a high temp natural cast iron coating for manifolds sold by Eastwood. Every other hi-temp coating I have tried fails as soon as I get the exhaust good and hot. Idling around won't get the exhaust that hot, so your trailer queen's exhaust might look nice longer. Putting a load on the engine for more than 20 minutes will cook off most hi-temp finishes. Even chrome plating tends to turn blue. Ceramic coatings are supposed to be able to withstand the heat, but the price is way beyond what I'm willing to spend to test that theory. In general all hardware holding the major castings together was painted when the assembly was painted. The next photo is sort of what the 8N tractors looked like on the assembly line when they were painted.